Outside of the prestigious festivals such as Bonnaroo, Lollapalooza, and Coachella, Hangout Festival has quietly built its reputation as one of the nation’s — and maybe the world’s — best festival experiences. The festival, nestled on the shores of the Gulf Coast and consistently delivering a boastful lineup, was exceptional again this year. They may have ditched the jam bands and indie acts for a more mainstream lineup. The volatile weather of Gulf Shores, Alabama on the fringe can be a nuisance (this was the second year in a row that dangerous weather caused delays and cancellations). Frank Ocean’s last-minute cancellation also marks the second year that a headliner has cancelled. It’s expensive, tough to get to, and a logistical nightmare if you aren’t staying immediately on Gulf Shores. The shuttle service from the surrounding beaches is expensive and at times a lengthy process. The beefed-up police pat downs, increased scrutiny, and increased drug related arrests left a bad taste in some festival goers mouths. In addition, the droves of frat guys in tanks, sorority girls in glitter, and Greek letters would make anyone over the age of 23 feel out of place at times. But, any event of this magnitude will encounter problems like these. I can make a similar list for those big budget festivals I previously named. None of these are problems big enough to deter me, nor should it deter you, from attending Hangout Festival in the future, because quite frankly, this is one of the most unique and unforgettable festival experiences in the world. Forget those who tell you that Bonnaroo or Coachella are bucket listers. Do yourself a favor and get to the beach. Plan early. Rent a condo. Grab some friends. And be prepared to be covered in sand for three awesome days. Because of the size of the lineup and the number of stages, it was not possible for me to see every act. I did my best, however, and below are the best moments of Hangout Festival 2017 I experienced. The hoopla over the inclusion of electric guitar into the signature Mumford & Sons sound is long gone. Mumford is still Mumford, which is nothing short of one of the best live acts one could possibly see right now. Marcus Mumford and ‘sons’ were cherry, spry, and carried themselves with an extra pep in their step all night. It must have been the ocean breeze and extra salt in the air because it wasn’t just them who seemed truly happy to be there. This performance was a breath of fresh air, but nonetheless intense at the same time. Chance the Rapper is leading a renaissance in both hip hop and the music business alike. To a layman, his performance goes a little something like this: part gospel revival, part commencement speech, part Kanye, part coloring book Chance the Rapper, part old school mix tape style Chance the Rapper, part jazz concert, and a little bit of everything in between. Chance the Rapper has a vision for himself and his fans and has since day one. His openness, honesty, and dedication the his craft are inspiring, and he and his band do a fabulous job of making you feel that. One of the coolest aspects of Hangout were the rather lengthy sets no matter the time. It’s unusual to see an artist who is performing before sun down getting over an hour. Local Natives took full advantage of their one-hour-and-15-minute-long set and drew an impressive crowd despite an early set time (2:30pm). They are one of those bands who is almost better live. I heard someone next to me say in complete awe, “Wow, these guys are great! I wished I had known about them earlier.” Well, you’ve been missing out, because Local Natives have quietly become one of the best indie acts out there. You have to see them live to fully appreciate their talent and instrumentation. This experimental alt rock act does not belong with the other middle of the bill artists for much longer. They first gained the attention of Columbia Records with the viral internet success of “Loud(y)”. They then gained the attention of the music fans world wide, after propelling that song to commercial radio airwaves and releasing an LP last October. Their experimental sound is unique to none other, incorporating Latin rhythms, electronic beats, synth noise samples, acoustic guitars, and percussion. Their live performance further exemplifies their uniqueness, something that will propel them to the top of lineups in the years to come. They don’t quite sound or look like anyone else, nor should they. I’ll be the first to tell you that I don’t quite get the attraction to the EDM scene, especially when it comes to live shows. It is slowly growing on me, but no way do I consider myself educated enough to properly critique any DJ, so I’ll leave well enough alone. However, it would be hard not to highlight one of the most crowded sets of the weekend, DJ or not. Forgive me, because Diplo (and those apart of his Major Lazer project), are laughing all the way to the bank. There were at least 15,000 festival goers who got it, putting the crowd at Twenty One Pilots‘ stage to shame. Those two should have been flipped if anything, because many festival goers considered Major Lazer as their headliner and left following their performance. I just labeled her as one of the best sets at Shaky Knees Festival prior to Hangout Festival, and, well, nothing has changed in the week since those performances. Most people know of her because of her wildly popular single “River”, but Bishop Briggs is much more than a one hit wonder. In fact, that isn’t the most enjoyable song of her live set, which really is a testament to her presence. Think of the stage presence of Florence Welch but dressed like she’s going to a My Chemical Romance concert, singing lyrics as deep as Twenty One Pilots but with the pop energy of a Lorde, and you have Bishop Briggs. She’s a unique blend of darkness mixed with youthful exuberance, that makes it hard not to like her. It’s almost as if they wrote their newest hit song, “Feels Like Summer”, with Hangout Festival in mind. While they’re albums are all over the place in terms of genre, Weezer’s live set was tightly packed with non-stop hits, designed perfectly for the early evening beach side setting and those who only know the hits. This was definitely the highlight of the day for many fans, as the only other alternative rock band playing later than them was Phoenix, who nonetheless put on a great show as well. Most of the crowd wasn’t even born at the time of Weezer’s inception, but the fact that so many showed up ready to sing along proves the power of Weezer’s legacy. 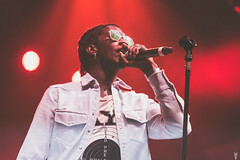 The smallest stage at Hangout Festival was sponsored and promoted by BMI and featured several up and coming artists worth a listen. Some of those artists include Barns Courtney, Susto, Cobi, Arizona, Foreign Air, and The Heydaze, among others. It’s easy to overlook the bottom of the bill acts, but this stage and BMI embraced these artists’ positions among the lineup. There were definitely a few performers on this stage who won’t be playing to such small crowds for much longer, the most notable being Barns Courtney. I will be the first to admit that I really dislike the necessary evil VIP has become at major festivals. 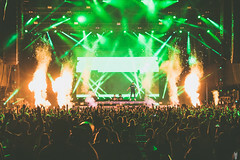 In order to keep prices reasonable for 95 percent of the festival goers, most major festivals offer exclusive, over-the-top packages aimed at raking up as much revenue as possible from the one-percenters of music festivals, if you will. The accommodations made for these people, in my opinion, take away from the ‘normal’ festival experience, and quite frankly, isn’t how one should fest. But if there is one festival in which VIP is worth it (and at prices in the thousands I’m using ‘worth it’ liberally), it’s Hangout Festival hands down. With the most premium viewing areas of any festival I’ve been to, unlimited food and drink, private acoustic performances, exclusive entry points into the festival grounds, private cabanas, in ground pools, and hot tubs, it’s hard not to salivate at those annoying VIPers. Sure it might be the most ridiculous scene outside of a Coachella house party, but there is something uniquely envious about sitting in a pool with a “free” drink and an unabated view of the main stage. Joshua Ostrander’s new brand of music, otherwise known as Mondo Cozmo, is beginning to grow on me. After first hearing “Shine” on the radio, I wasn’t sold. The bold rock stylings, hip-hop elements, Bruce Springsteen-esque grittiness, and Bob Dylan-inspired folksiness combine to make a unique sound, one you either like or don’t like. Whether he does or not, Ostrander appears to carry himself with a chip on his shoulder. He’s been at it for well over a decade and is just starting to receive national recognition. This makes for the perfect blend of a give-no-f**ks -but-yet-grateful-at-the-same-time sort of attitude. There’s an earthy, gritty, and pure element to him that I can’t quite pinpoint, but I like it nonetheless. With appearances at numerous festivals this summer and a new album on the way, the French indie rockers are beginning to transform into professional headliners. 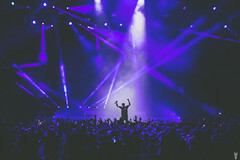 They have some work to do in regards to building a bigger US fan base, as their Friday night headlining slot at Hangout Festival was one of the smallest crowds on that stage of the entire weekend. Those who weren’t there, either because they didn’t know Phoenix or were too upset about the cancellation of Frank Ocean (who Phoenix replaced last minute), missed out on a flawless set.